There are several ways to become involved with a rescue organization like DIBS! 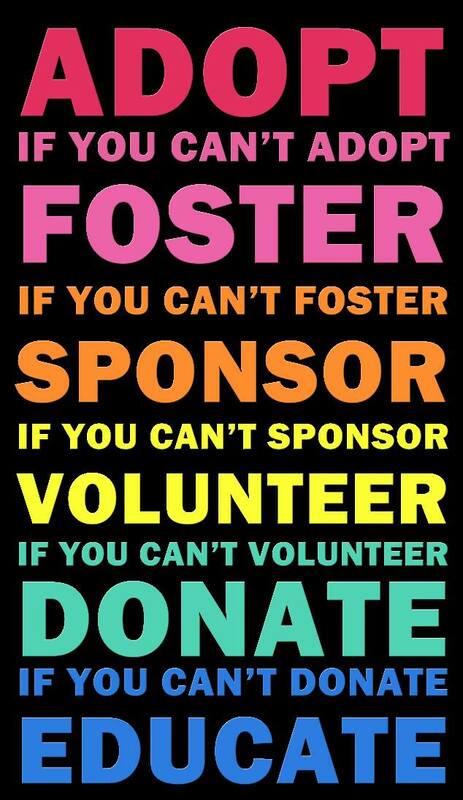 Fostering: We are always looking for new approved foster homes. You set your own schedule and can request preferences based on what works best for your home. Please fill out an application to foster. Screening: We can always use volunteers to do phone screening (45 mins), reference checks (30 mins) or Home Visits (30 mins). Donate: Please see here for more information on donating. Thank you! I would like a (INSERT PREFERRED BREED HERE)….is that a possibility with a rescue dog? We generally, like what we like! Some of us want a dog that will play with my family, or a dog that will run with me. There are lots of different characteristics that people look for in a dog. At times, people are looking for a specific breed. While most of our rescues are mixed breeds (the popular choice these days) we do come across pure-breds from time to time. Keep watching our site, look on Petfinder (which covers many different rescue orgs) and specify what you are looking for in your search. Be able to demonstrate that you’re willing to spend the time and money necessary to provide training, annual and emergency medical treatment, and proper care for the lifetime of your dog. Adoption application This will take approximately 20-30 minutes to complete and includes providing a vet reference (if applicable), as well as 3 personal references. Phone interview The phone interview with one of our screening volunteers will take approximately 30-40 minutes depending on how many questions you have. Depending on your availability, this typically takes place within 2-3 days of receiving your application. Home visit The home visit, conducted by one of our screening volunteers, will take approximately 20-30 minutes. Depending on your availability* and location**, this typically takes place within a week of the phone screen being completed. * Please note that all family members and those living in the household must be present at the time of the home visit. ** Please note that there may be certain locations in Ontario where we do not have volunteer coverage. In these situations it could take longer to conduct your home visit. We do try to process as soon as possible, as our goal is to get our rescues placed in their forever homes quickly. Some have had a rough start to life, and we are excited to have them adopted and get the love they deserve. As a result, we try to move through the stages quickly. But, we can’t skip any steps – all are required from application, to phone screen and references, to home visit and the final approval/denial. Working together – adopter and foster – expedites the process. Why so much screening? Reference checks? Home visit? At DIBS, we focus on the difference between placing a dog in a home, and placing a dog in the RIGHT home. Many dogs are adopted as puppies and later abandoned – sometimes due to moving, new baby, or the dogs personality may be too much! All reputable rescues strive to place each dog into its forever home, rather than giving him/her to the first person who expresses interest. Very often, we get several applications for each dog. We are likely to have a phone screen with applications that we feel are a good fit. We won’t make a final decision until we meet the dog. Once they are in foster for a week, we learn a lot about the dog and their preferences. Do they enjoy another pet in the home? Do they prefer people over animals? Are they ok alone in the day, or do they prefer a lot of interaction. What is their activity level? Could their physical energy be too much for young children? Could they be a running partner? There are many things to consider, and we may review a fantastic applicant, but once we interact with the dog, they may not be the right fit for that particular dog. If that’s the case, we like to work together, to find the right fit. Every dog deserves the right home! Why do you ask for our Veterinarian’s details and a reference? We call your past vet for a reference just to find out more about your past/current pets health and history. We require that our rescues be vetted regularly and kept up to date on vaccinations. As part of your adoption contract, we do ask that you see a vet within the first few weeks (set up a file, get the dog micro-chipped, general meet & greet) and we want to ensure that you have thought about veterinary care and have made that contact. We also want to ensure that they are in support of heart-worm prevention, as this is such an important part of keeping your new dog healthy. Why do you visit my home? The purpose of the home visit is to ensure the dog will be in a safe environment. We will discuss fencing, household chemicals, and other household items that could be a danger for a dog. It also gives us a chance to meet the entire family (everyone must be present for the home visit) and ensure everyone is on board, and equally enthusiastic and invested in the adoption process. Why do you ask for so much personal information? It would be much easier to go to the store and buy a puppy! Yes, it is “easier” – but are you getting the right puppy? Store dogs are often from reputable breeders or from puppy mills. You never know the source of a dog purchased through a store, even if you ask, or even the past vetting information. Also, you won’t know the personality of the dog until you get home. Sadly, these are the dogs that are often abandoned at shelters, as they were purchased on a whim, or the personality wasn’t what they expected. While we try to keep the process streamlined, “easy” isn’t our goal. Our goal is to ensure our adoptions are successful for everyone! Why do you ask for so much personal information? It would be much easier to go to the store and buy a puppy! Certainly it is easier to walk into a store and buy a puppy, but it is exactly this “instant gratification” mentality that has contributed to the hundreds of thousands of homeless (and subsequently euthanized) pets in Canada today. Adopting a dog is a lifetime commitment and not something to be done on a whim. The nature of rescue is that we have a duty to ensure our dogs are homed with a family best suited for them, with applicants who believe in the ideals of rescue and have the patience to work through the screening process. The application provides the exact details we need to make the right decision for each dog, and each potential forever home. Therefore, all incomplete applications (unless otherwise specified) will not be considered as the information requested is absolutely critical to the adoption process. How much are adoption fees? $500 is the adoption fee. This includes spay/neuter & all vaccinations. How do I pay? Payment can be made by etranfer or PayPal (friends and family option). Send payment to contact@dibsrescue.com Cash is also fine. (Note to fosters: you can send the payment to paypal, if adoption fee is paid in cash) What is included? What does the adoption fee include? Why are your fees more than a animal shelter? DIBS Rescue is committed to, and pride ourselves in providing extensive veterinary care above and beyond what many rescues do, and certainly far more than pounds and shelters. The sad reality is that we often get the most unwanted, un-vetted and uncared for dogs. Of course, this is a conscious effort on our part as we see potential in all dogs, regardless of age, breed, gender or size. Many adult dogs come to us in need of extensive medical and/or dental care. Veterinary costs for the special cases can run into thousands of dollars. Younger, healthier dogs may not have quite the same needs as the older dogs do but they too must be examined, vaccinated, dewormed, temperament checked and spayed/neutered prior to adoption. While our supporters and partner veterinarians are amazingly generous, donations only begin to defray our expenses. We offset the difference through our ongoing fundraising efforts. Why is there a fee? The reason for the adoption fee is two-fold: First, it helps to defer some of our costs associated with the vetting costs of that particular dog. Second, it is an important financial investment in the dog by you, the adopter. Often we take in dogs that require thousands of dollars in veterinary care, and only receive a small portion of that back at the time of adoption. There is no profit through adoption fees. Can I visit the dog I’m interested in? Can my dog come? Most dogs receive several applications as soon as they are available. We do encourage interested adopters to fill out an application as soon as you see a dog that you like. You can ask the foster to meet the dog, pre-application, but please note, the foster is likely to receive several application during this process. So, our suggestion is, fill out the application asap, start the screening and arrange for a meeting. If you are approved to adopt and feel that the preferred dog isn’t a match, we can try again! Once approved, please arrange for a meet and greet with the family, and bring your current dog (if applicable). Taking home a new dog that is not a good match with your current dog is not something we would ever want to have happen for you or the dogs. Fencing – what kind is ok? Not ok? DIBS Rescue always prefers our dogs to be placed in a home with a fenced yard. But, there are many dogs who don’t have this need. They are more than happy to go for walks, instead of playing in the yard. Not having a yard may be a factor, but it does depend on the dog. This will be something to explore with the foster, once they know the dog well enough. Generally, we have concerns with invisible fencing. They do need to be used carefully to ensure dog isn't negatively affected. Great concerns lie with other animals being able to get into the yard, and at times the dog may impulsively get out, but then fears returning. How will the dog fit into my family/lifestyle? Please take time to thoroughly read the dog’s bio/profile and feel free to e-mail the foster home questions about what to expect. I have children; what should I take into consideration? If you are looking for a dog that will be good with children, it will be noted in the dog’s bio and his/her foster home can provide you with relevant information. Please remember that young children need to be taught how to interact positively with dogs of all types and sizes BEFORE you bring one into your home. We can provide you with some links and tips on this crucial topic. Am I willing to commit to obedience classes with my dog? Please do – we advise even experienced dog parents to take their new dog to class. It helps both of you establish a solid relationship in a positive, public environment. Yes – it is a legal requirement of our adoption contract. If, after extensive training, education and communication with us, an adopted dog does not work out in your home or you are suddenly unable to care for the dog, he/she must be returned to us. At the time of adoption, you will be asked to sign a clause stating that you will return the dog to us should you be unable to keep or care for the dog. We are based on in and around the GTA, in Ontario Canada. We do not have a shelter and our rescues have the opportunity to thrive in foster homes, under the care of our volunteer foster families. DIBs dogs primarily come from reputable rescue organizations in Mexico and Florida. While many Mexican based rescue organizations perform spay/neuter clinics, free vetting for family pets in need, and manage many donations – many dogs still find their way into shelters. Why are some of your dogs originally from the Mexico? Aren’t there enough dogs in Canada that need help? First of all – Canadians are amazing! Local shelters also get dogs from US and Mexican shelters, as Canadians have been early adopters to rescue programs. We also have high standards regarding spaying and neutering. The sad reality is that there are dogs all over not only North America but the World, who are homeless and in need of new forever families. There are many organizations in existence that focus on dogs from northern Canada, U.S and rescues worldwide. Our focus has been on dogs that need help in Florida and Mexican shelters. Without organizations helping these dogs get adopted, they can spend their entire lives in shelters, never having a home of their own. Many of these dogs are wonderful, sweet dogs yet would not have a chance at adoption unless they were brought to Canada. A dedicated network of volunteers across the from Mexico, United States and Canada work together to save these dogs – one Mexi-Mutt at a time. How do I get rid of my dog? If you are looking to rehome your dog, please never offer it as “Free to a Good Home” as this is the most common way for animal abusers, dog flippers (those who take free dogs by pretending to be a good home, and then sell them) and others with very bad intentions to obtain free animals. Your dog/puppy (or cat/kitten) could end up as bait for intentions for illegal dog fighting rings, in a puppy mill or with a backyard breeder (if you haven’t had him/her spayed/neutered), in a medical lab for vivisection/research, or harmed by sick individuals. Your animal has his/her best chance with you, a family member or friend. If you must surrender the animal, make sure it is to a no-kill shelter or a reputable rescue group, and be honest about the health and behavioral issues of the dog. Please note: Whenever we are able to take an owner-surrender into foster care, we strictly adhere to the Canadian Privacy Act, meaning that all previous owner’s information is kept confidential. All medial information is shared with the adopters’ own vet, however, with the original owner’s name redacted. What is included from a vetting perspective? All DIBs dogs are vaccinated and spayed/neutered prior to adoption. Dogs are vaccinated with DA2LP + PV (Canine Distemper – Adenovirus 2 – Para influenza – Parvo Virus Vaccine) and the Rabies vaccination (if old enough upon adoption). Puppies will not be adopted out before the age of 8 weeks, and will have their first vaccines. We also examine dogs for any signs of TVT. What is DIBS doing to help alleviate the stray animal overpopulation? DIBS is working diligently in the community to raise awareness regarding the spaying and neutering of companion animals. Every dog that we take in is spayed or neutered before he/she is placed in a foster home. We also educate the public and our followers about spaying and neutering. One of our partners in Mexico, just held a spay / neuter clinic, where they were able to sterilize 120 cats and dogs! DIBS was a main funder of that campaign, to ensure the volunteers and vets could help as many pets and families in need. I love dogs, but I love Pokemon Go too….how do I manage both? Great question and we are so glad that you asked! As you know, the best place to hunt Pokemons is in parks, or while out on a walk. And, you know who else likes parks and walks? DOGS DO!!! Grab your phone, open your app, get your dog on a leash and go! We generally, like what we like! Some of us want a dog that will play with my family, or a dog that will run with me. There are lots of different characteristics that people look for in a dog. At times, people are looking for a specific breed. While most of our rescues are mixed breeds (the popular choice these days) we do come across pure-breds from time to time. Keep watching our site, look on Petfinder (which covers many different rescue orgs) and specify what you are looking for in your search. But, we would love you to keep an open mind too! We have yet to hear of someone who hasn’t fallen in love with their Mexi-Mutt! Do you adopt to families that smoke? How much are adoption fees? $425 is the adoption fee. This includes spay/neuter & all vaccinations. How do I pay? Paypal is preferred. Send payment to contact@dibsrescue.com Cash is also fine. (Note to fosters: you can send the payment to paypal, if adoption fee is paid in cash) What is included? What does the adoption fee include? Why are your fees more than a pound? DIBS Rescue is committed to, and pride ourselves in providing extensive veterinary care above and beyond what many rescues do, and certainly far more than pounds and shelters. The sad reality is that we often get the most unwanted, un-vetted and uncared for dogs. Of course, this is a conscious effort on our part as we see potential in all dogs, regardless of age, breed, gender or size. Many adult dogs come to us in need of extensive medical and/or dental care. Veterinary costs for the special cases can run into thousands of dollars. Younger, healthier dogs may not have quite the same needs as the older dogs do but they too must be examined, vaccinated, dewormed, temperament checked and spayed/neutered prior to adoption. While our supporters and partner veterinarians are amazingly generous, donations only begin to defray our expenses. We offset the difference through our ongoing fundraising efforts. Why is there a fee? The reason for the adoption fee is two-fold: First, it helps to defer some of our costs associated with the vetting costs of that particular dog. Second, it is an important financial investment in the dog by you, the adopter. Often we take in dogs that require thousands of dollars in veterinary care, and only receive a small portion of that back at the time of adoption. There is no profit through adoption fees. DIBS Rescue always prefers our dogs to be placed in a home with a fenced yard. But, there are many dogs who don’t have this need. They are more than happy to go for walks, instead of playing in the yard. Not having a yard may be a factor, but it does depend on the dog. This will be something to explore with the foster, once they know the dog well enough. DIBS does rescue owner-surrendered dogs when we are able, though we typically concentrate on dogs that are in shelters for long periods of time, and have no other hope of rescue in sight. We promote responsible animal ownership and can suggest training and veterinary resources if you are having behavioral problems with your dog that may be resolved. If these issues cannot be solved and surrender is the only option, please contact us at contact@dibsrescue.com for more information. If you are looking to rehome your dog, please never offer it as “Free to a Good Home” as this is the most common way for animal abusers, dog flippers (those who take free dogs by pretending to be a good home, and then sell them) and others with very bad intentions to obtain free animals. Your dog/puppy (or cat/kitten) could end up as bait for intentions for illegal dog fighting rings, in a puppy mill or with a backyard breeder (if you haven’t had him/her spayed/neutered), in a medical lab for vivisection/research, or harmed by sick individuals. Your animal has his/her best chance with you, a family member or friend. If you must surrender the animal, make sure it is to a no-kill shelter or a reputable rescue group, and be honest about the health and behavioral issues of the dog. Please note: Whenever we are able to take an owner-surrender into foster care, we strictly adhere to the Canadian Privacy Act, meaning that all previous owner’s information is kept confidential. All medial information is shared with the adopters’ own vet, however, with the original owner’s name redacted.